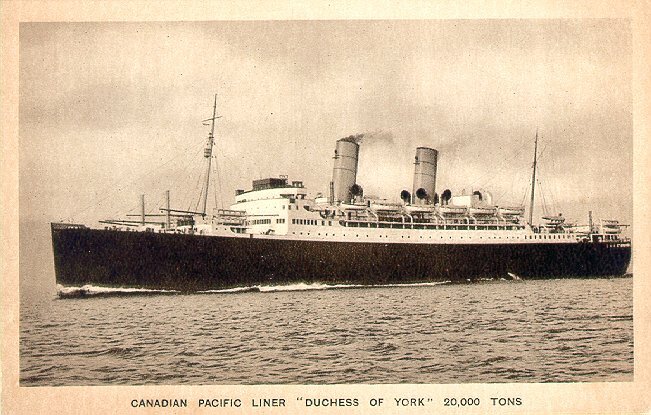 Duchess of York was built for Canadian Pacific by John Brown & Co. of Glasgow, where she was launched by her namesake in 1928. (Laid down as Duchess of Cornwall, she was renamed prior to her launch so that she would be named for a living person.) Her maiden voyage on 22 March 1929 was from Liverpool to St. John, New Brunswick. She remained on that route, with some cruising service as well, until the end of 1939. Then, in the spring of 1940, she was requisitioned for trooping. She was bombed off the coast of Portugal on 11 July 1943, with the loss of 23 troops and 11 crew. On fire and abandoned, she was torpedoed by her convoy escorts the next day and sunk. Sister ships: Duchess of Bedford/Empress of France II; Duchess of Atholl; Duchess of Richmond/Empress of Canada II. Sister ships: Duchess of Bedford/Empress of France (II); Duchess of Atholl; Duchess of Richmond/Empress of Canada (II). Sources: Williams' Wartime Disasters at Sea; Haws' Merchant Fleets; Bonsor's North Atlantic Seaway.